Mucor is a saprophytic fungus, which cause aggressive, angioinvasive disease in immunocompromised people and uncontrolled diabetes. It causes five major forms of infection: Rhinoorbitocerebral, pulmonary, disseminated, cutaneous, and gastrointestinal. Apart from these, there are some less common forms of mucormycosis like endocarditis, osteomyelitis, peritonitis, and pyelonephritis. Mucormycosis involving the ear is a rare occurrence. There are few reports of invasive mucormycosis of the temporal bone in immunocompromised patients. , There is only one reported case of mucormycosis of middle ear and mastoid in a nondiabetic person, who was treated by radical mastoidectomy. We are reporting a case of mucormycosis of the middle ear in a middle aged lady, which was diagnosed incidentally while performing revision tympanoplasty for a failed tympanoplasty done for tubotympanic chronic suppurative otitis media. A 45-year-old woman presented to us with recurrent, profuse, mucopurulent discharge from left ear for last 25 years. It was aggravated during episodes of upper respiratory tract infection. She also reported progressive hearing loss in same ear. She had undergone tympanoplasty in this ear, 20 years back. But she continued to have discharge from this ear even after tympanoplasty. We could not get the operative details, as the patient did not have any records with her. She did not have any systemic illness. She was in good general health state. Otoscopic examination revealed large central perforation of left tympanic membrane, involving all the four quadrants. Middle ear mucosa appeared edematous. Tuning fork tests were suggestive of conductive hearing loss in left ear. Pure tone audiometry showed a 45 dB hearing threshold in left ear. X-ray of mastoids showed sclerosed mastoid air cells on left side. Cortical mastoidectomy with tympanoplasty was done under general anesthesia. Middle ear mucosa was edematous. Handle of malleus was partially eroded. There was a sac of grayish materials seen in the middle ear cavity near Eustachian tube orifice. It was completely cleared and sent for histopathological examination. Mastoid antrum was healthy, and the aditus was patent. Temporalis fascia graft was placed as underlay. Postoperative period was uneventful. Histopathological examination of the specimen revealed fibrocartilaginous tissue with plenty of fungal hyphae which are broad based, aseptate with right angle branching [Figure 1]. Gomori's methanamine silver stain was positive for fungus [Figure 2]. 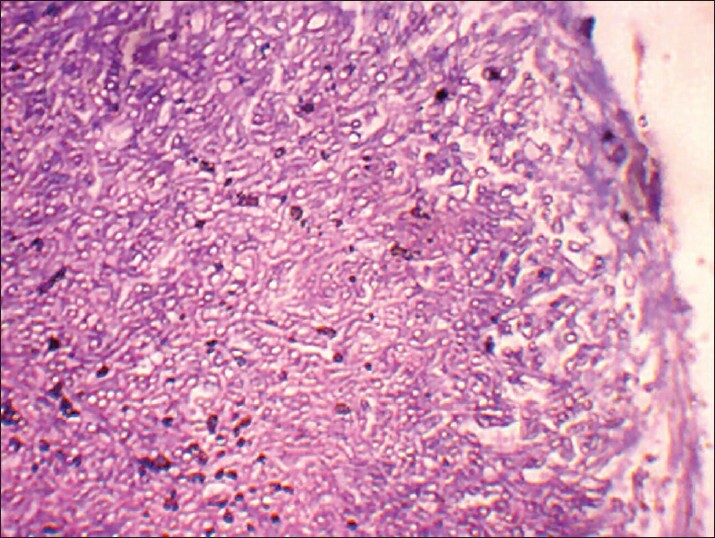 Histopathological features were suggestive of mucormycosis. There was no vasculitis and tissue invasion. We performed diagnostic nasal endoscopy to look for any nasal pathology but did not reveal any abnormality. Patient was discharged after a week and is on regular follow-up. The graft uptake was good and was epithelialized in 4 weeks. Patient had good improvement in hearing. After 2 months, the hearing threshold in left ear was 26 dB. She is on regular monthly follow-up for last 6 months and there is no complaint related to ear. Diagnosis of mucormycosis is by histopathological examination of the infected tissue and by culture of the organism. The fungus grows on Sabouraud dextrose agar and forms fluffy white, gray, or brownish colonies within 1-7 days. Direct microscopic examination can be done with 20% potassium hydroxide (KOH), Gomori's methenamine silver staining, hematoxilin and eosin staining (H and E), or periodic acid-Schiff staining (PAS). They are classically described as broad ribbon-like aseptate hyphae with right-angled branching. Actually, they are pauciseptate and the angle of branching can vary from 45° to 90°. Histopathologically, angioinvasion and tissue invasion are typical of this infection. However in our case, there was no angioinvasion or tissue invasion. In our case, we could not get the culture done, as the specimen was send in formalin solution for histopathological examination, as we did not suspect this infection either preoperatively or during procedure. We had to rely solely on histopathology for diagnosing this condition. Successful treatment of invasive mucormycosis requires early diagnosis, control of underlying risk factors, surgical debridement of necrosed issue and antifungal therapy. Amphotericin B is the preferred antifungal for the treatment of mucormycosis. Nephotoxicity is a notorious adverse side effect of amphoterecin B. The lipid formulations of amphoterecin B, especially liposomal amphoterecin B are more effective, has better survival with minimal adverse effects. Among the triazoles, posaconazole has activity against mucormycosis, but less effective than amphoterecin B. We did not start any antifungal treatment for this case, as the histopathological examination did not show any vasculitis or tissue invasion. The debris was completely cleared during tympanoplasty, and patient had successful graft uptake, and on follow-up there was no complaints related to the operated ear. Hazarika et al.,  in their report of a case, opined that mucormycosis in the middle ear in a nondiabetic patient is noninvasive and may occur as indolent infection which may coexist with chronic suppurative otitis media. In our case, this infection is possibly the cause of failure of tympanoplasty, but we do not have any evidence to prove this, as patient did not have any records of the previous surgery. This is the first case of noninvasive mucormycosis limited to middle ear in a nondiabetic person, to the best of our knowledge. 1. Prabhu RM, Patel R. Mucormycosis and entemophthoramycosis: A review of the clinical manifestations, diagnosis and treatment. Clin Microbiol Infect 2004;10 Suppl 1:31-47. 2. Ribes JA, Vonover-Sams CL, Baker DJ. Zygomycetes in human diseases. Clin Microbiol Rev 2000;13:236-301. 3. Petrikkos G, Skiada A, Lortholary O, Roilides E, Walsh TJ, Kontoyiannis DP. Epidemiology and clinical manifestations of mucormycosis. Clin Infect Dis 2012;54 Suppl 1:S23-34. 4. Gussen R, Canalis RF. Mucormycosis of the temporal bone. Ann Otol Rhinol Laryngol 1982;91:27-32. 5. 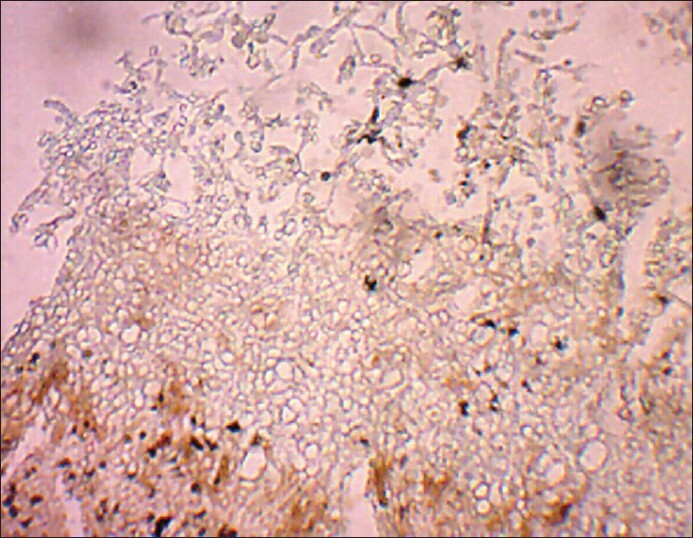 Tuzcu A, Bahceci M, Celen MK, Kilinc N, Ozmen S. Necrotizing (malignant) Otitis externa: An unusual localization of mucormycosis. Indian J Med Microbiol 2006;24:289-91. 6. Hazarika P, Zachariah J, Victor J, John M, Devi C, Abraham P. Mucormycosis of the middle ear: A case report with review of literature. Indian J Otolaryngol Head Neck Surg 2012;64:90-4. 7. Solano T, Atkins B, Tambosis E, Mann S, Gottlieb T. Disseminated mucormycosis due to Saksenaea vasiformis in immunocompetent adult. Clin Infect Dis 2000;30:942-3. 8. Sun HY, Singh N. Mucormycosis: Its contemporary face and management strategies. Lancet Infect Dis 2011;11:301-11.